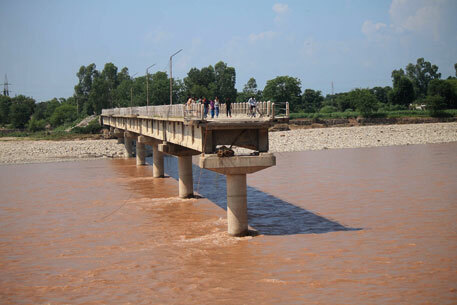 The flood in Jammu & Kashmir (J&K) is again a grim reminder that climate change has started to hit India hard. But there is a complete denial on part of the Indian scientific community and the government to link extreme weather events with climate change. On July 26, 2005, when Mumbai was deluged with 994 mm of rainfall in 24-hours and thousands of people died, the India Meteorological Department (IMD) wrote in its annual report that it was caused due to “meso-scale convection around Mumbai”. It called it as an “exceptionally heavy rainfall event”, but refused to link it with the changing climate. On August 6, 2010, when Leh town was completely devastated and 200 people died because of the cloudburst in which 250 mm of rainfall occurred in an hour, scientists used terms such as “freak” and “unusual” to define this extreme weather event. IMD in its official report stated that “the western Himalayan region experiences the cloud burst events during the monsoon season in association with the strong monsoon circulation or the interaction of monsoon circulation with the mid-latitude westerly system, but Laddakh region of J&K is not known to be frequently affected by this type of phenomena. It is a cold desert and average rainfall for the month of August is 15.4 mm only.” Having stated this, IMD scientists went on record and said that what happened in Leh had nothing to do with climate change. In June, 2013, Uttarakhand was devastated by extreme rainfalls. On June 17 alone, some parts of Uttarakhand recorded more than 340 mm of rainfall, which is 375 per cent more than the daily normal. IMD reported a weekly departure of about 847 per cent in the rainfall volume for the week ending on June 19, 2013. It affected all 13 districts (four districts were devastated), killing 5,700 people and causing economic loss of more than Rs 10,000 crore. The cause of this extreme event was attributed to the strong interaction between “the westerlies and the monsoon system over the Uttarakhand” by IMD. However, IMD in its official report went on to state: “ The episode was unique in that, the line of convergence of the two weather systems was nearly stationary for hours at a time, resulting in huge amount of accumulated rainfall causing widespread flooding.” But most Indian scientists refused to link this “unique” event with climate change. The fact is that Indian scientists have termed all the four extreme rainfall events as “unique”, “unprecedented”, and “unusual”. But they have failed to explain why these “unique”, “unprecedented”, “unusual” events are happening so frequently. The worst part is that they have refused to even entertain the idea that climate change might be playing some role in these events. The Ministry of Environment and Forests and Climate Change (MoEF&CC), on the other hand, has not even uttered a word on these extreme rainfall events. But the world is not waiting for the verdict of the Indian official scientific community or the MoEF&CC. The fifth assessment report of the Intergovernmental Panel on Climate Change (IPCC), released in 2014 and the Special Report on Managing the Risks of Extreme Events and Disasters to Advance Climate Change Adaptation released by IPCC in 2011, clearly indicate that India will be hit more and more by extreme rainfall events as the world continues to warm in the coming decades. In fact, most climate models (including those run by Indian scientists) predict that, in general, we are going have more rainfall but less rainy days. This means that we will have more intense rainfalls in the future. Whether we attribute these extreme events to the “interaction between western disturbances and monsoon” or not (western disturbances are blamed for everything), the fact is we will have to start preparing to deal with such extreme events. But we can only prepare ourselves properly if we get out of the denial mode. Presently, all extreme weather events are considered as part of the “normal cycle of droughts and floods” that has affected us for centuries. Our response, therefore, is reactive in nature. But in the rapidly warming planet (CO2 concentration in the atmosphere now exceeds 400 ppm), past is not going to be a good indicator for the future. The government will have to internalize the fact that climate change is going to affect us more and more in the future. Once we do this, then our approach would be proactive and we will be able to build resilience against extreme weather events in true sense. Most studies show that India is one of the most vulnerable countries to climate change. A warmer planet will affect India the most; especially the poor of India. It is in our interest to be proactive in addressing climate change.